Paul Sutter is an astrophysicist at The Ohio State University and the chief scientist at COSI Science Center. Sutter is also host of Ask a Spaceman, RealSpace and COSI Science Now. About 5 billion years ago, everything changed. The expansion of the universe, which had been gradually decelerating for billions of years, reversed course and entered into a period of unbridled acceleration. (It was sort of like a car that switches from decelerating to accelerating, but is still moving forward the whole time.) The unhurried, deliberate process of structure formation — the gradual buildup of ever-larger assemblies of matter from galaxies to groups to clusters — froze and began to undo itself. Five billion years ago, a mysterious force overtook the universe. Hidden in the shadows, it lay dormant, buried underneath fields of matter and radiation. But once it uncovered itself, it worked quickly, bending the entire cosmos to its will. Five billion years ago, dark energy awoke. To explain what’s going on in this overly dramatic telling of the emergence of dark energy, we need to talk about what the universe is made of and how that affects its expansion. Let’s start with the mantra of general relativity: mass and energy tell space-time how to bend, and the bending of space-time tells objects how to move. Usually, we think of this as a local interaction, used to explain the orbits of particular planets or the unusual properties of a black hole. But those same mathematics of relativity -- which provide the needed accuracy for GPS satellites to tell you how close you are to your coffee fix — also serve as the foundation for understanding the growth and evolution of the entire universe. I mean, it is “general” relativity after all. The universe is made of all sorts of stuff, and the properties of that stuff influence the overall curvature of the entire cosmos, which impacts its expansion. 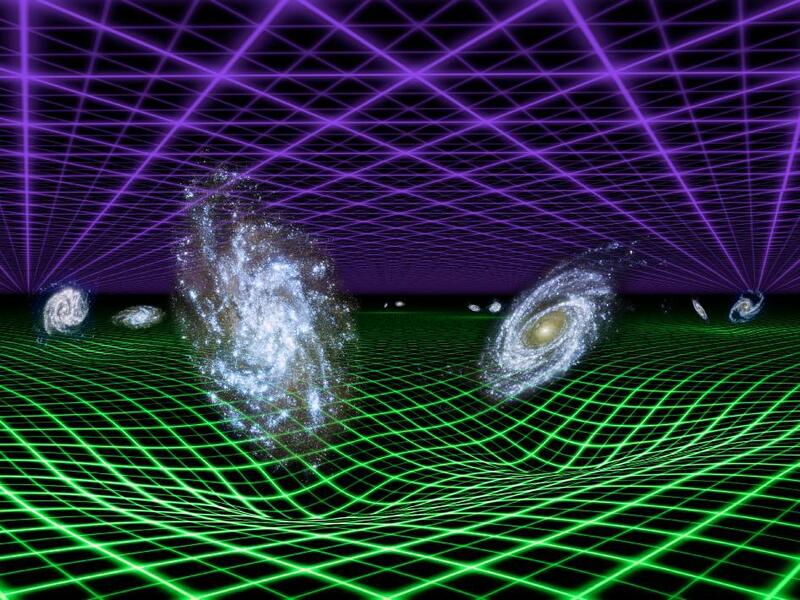 It’s the mantra of relativity writ large: the mass and energy of the entire universe is bending the spacetime of the entire universe, which is telling the entire universe how to move. If the total density of all the stuff is greater than a very specific value -- called “the critical density” and equal to about 4 hydrogen atoms per cubic meter -- then the universe’s expansion will slow down, stop and reverse in a Big Crunch. If the universe’s density is less than this critical value, the universe will expand forever. And if it’s exactly equal to the critical value, then the universe will expand forever, but at an ever-diminishing rate. Measurements suggest that we live in a contradictory universe, where the total density exactly equals the critical density — but the universe’s expansion is still accelerating as if the density was too low. What in Hubble’s ghost is going on? What’s going on is dark energy. Totaling 69.2 percent of the energy density of the universe, it simply behaves … strangely. Dark energy’s most important property is that its density is constant. Its second most important property is that it appears to be tied to the vacuum of empty space. Take a box, and empty out everything, removing all the matter (regular and dark), neutrinos, radiation ... everything. If you did it right, you’ll have a box of pure, unadulterated vacuum — which means you’ll have a box of pure dark energy. Double the size of the box, and you’ll have double the dark energy. This behavior is the total opposite of the behavior of matter and radiation. If you have a box (or, say, a universe) with a fixed amount of matter and you double that container’s volume, the density of matter is cut in half. Radiation’s energy density goes down even further: Not only does the expansion of the universe dilute radiation, it also stretches out its wavelength. But as the universe expands, we continually get more empty space (vacuum) in it, so we continually get more dark energy. If you’re worried that this violates some sort of principle of conservation of energy, you can rest easy tonight: The universe is a dynamic system, and the form of the conservation laws taught in Physics 101 only apply to static systems. The universe is a dynamic place, and the concept of “conservation of energy” still holds but in a more complex, noninuitive way. But that’s an article for another day. You may also be wondering how I can talk so confidently about the nature of dark energy, since we don’t seem to understand it at all. You’re right: We don’t understand dark energy. At all. We know it exists, because we directly observe the accelerated expansion of the universe, and a half-dozen other lines of evidence all point to its existence. And while we don’t know what’s creating the accelerated expansion, we do know that we can model it as a property of the vacuum of space that has a constant density, so that’s good enough for now. The fact that dark energy has constant density means that in the distant past, it simply didn’t matter -- because of matter. All the stuff in the universe was crammed into a smaller volume, which means regular and dark matter had very high densities. This high density meant that for a long time, the expansion of the universe was slowing down. But as expansion continued, the matter and radiation in the universe became more and more dilute, and they got less and less dense. Eventually, about 5 billion years ago, the density of matter dropped beneath that of dark energy, which had been holding constant all that time. And once dark energy took over, the game changed completely. Because of the constant nature of its density, compared to the lowering density of matter, expansion not only continued but also accelerated. And that accelerated expansion halted the process of structure formation: Galaxies would love to continue gluing onto each other to form larger structures like clusters and superclusters, but the intervening empty space is inexorably pulling them apart. Some chance mergers will continue to happen, of course, but the universe’s days of building larger structures are long over. The emergence of dark energy leaves us with a little puzzle. In the distant past, when matter densities were incredibly high in a compact universe, dark energy didn’t matter at all. In the distant future, matter will be spread so thin -- like too little butter over too much bread -- that its density will be ridiculously, hilariously, pathetically small compared to dark energy’s. Right now, we live in the in-between epoch, where dark energy is roughly three-quarters of the total mass-energy of the universe and dark matter is about one-quarter (regular matter is a negligible amount). This seems a bit … coincidental. Considering the grand history of the universe, we just happen to observe it in the tiny slice of time when matter and dark energy are trading places. Did we just happen to get lucky? To arise to consciousness and observe the universe where both dark matter and dark energy are of roughly equal strength? Or is the universe telling us something more? Maybe it’s not a coincidence at all. Maybe dark matter and dark energy “talk” to each other and keep in balance via additional forces of nature; forces that simply don’t manifest in Earthly laboratories. Maybe they’re connected and related. Or maybe not. We simply don’t know. It’s a little too dark out there to tell. Learn more by listening to the episode “What’s the universe made of?” on the Ask A Spaceman podcast, available on iTunes and on the Web at http://www.askaspaceman.com. Thanks to Michael M., Peter B. and DR1851 for the questions that led to this piece! Ask your own question on Twitter using #AskASpaceman or by following Paul @PaulMattSutter and facebook.com/PaulMattSutter.